The Grand Cret is designed for the casual mountaineer and delivers high performance and versatility with a soft and breathable fabric and a set of features to suit multiple mountain sports. The Gore-Tex Orcan 2L combines lightweight and excellent resistance to abrasion. Its textured polyester threads construction optimizes comfort without compromising its breathability, long-lasting waterproof and windproof performance. 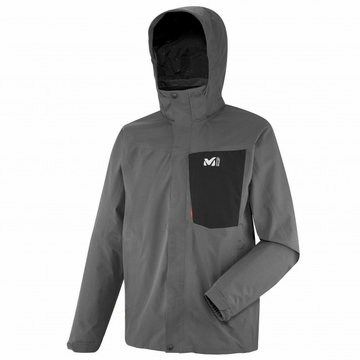 It is softer than the 3-layer membrane and a breathable and soft mesh fabric lining provides next-to-skin comfort that makes the jacket ideal to wear with a short-sleeved or light construction layer. The Regular Fit prioritizes comfort and ease of movement with a great deal of room to accommodate multiple layers without binding or restricting movement. A double-flapped front opening creates a barrier against water entry and when needed, excess heat can be released using the underarm vents. The removable hood cinches securely and a Lycra panel at the collar seals the elements out, compensating for protection. With tonal colour combos and from a sportswear look to urban style, the Grand Cret jacket is deal for alpine and hiking adventures, as well as everyday use, all year long.